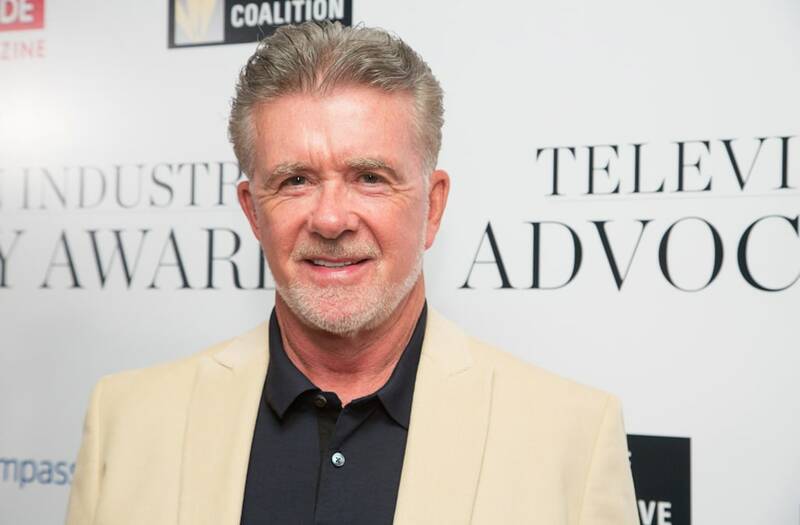 Actor Alan Thicke died suddenly on Tuesday at the age of 69. The "Growing Pains" actor was reportedly playing hockey with his 19-year-old son, Carter, when he had a massive heart attack. The actor was reportedly transported to Providence St. Joseph's Medical Center around noon where he was pronounced dead. Thicke is father to singer, Robin Thicke, Brennan and Carter. He has been married to his third wife, Tanya, since 2005. Actress Valerie Harper and actor Alan Thicke attend the Kenny Rogers in Concert: 'The Gambler' Tour on September 14, 1979 at the Universal Amphitheatre in Universal City, California. Actor Alan Thicke and son Brennan Thicke attending 'Celebrity Fashion Show Benefiting Windfeather' on June 10, 1984 at the Beverly Wilshire Hotel in Beverly Hills, California. Actor Alan Thicke and actress Gina Gallego attending Third Annual American Diabetes Association Waiters Brunch on February 9, 1985 at Baxter's Restaurant in Westwood, California. Actor Alan Thicke attending the premiere party for 'Out of Africa' on December 10, 1985 at the Plitt Theater in Century City, California. GROWING PAINS - 'The Kid' - Airdate: December 16, 1985. Actor Alan Thicke attending 59th Annual Hollywood Christmas Parade on November 25, 1990 in Hollywood, California. Actor Alan Thicke and sons Brennan Thick and Robin Thicke and Actress Joanna Kerns attend the 'Celebration of Tradition' A Gala Event Gathering Warner Bros. Stars on June 2, 1990 at Warner Bros. Studios in Burbank, California. Actor Alan Thicke attending 9th Annual MacLaren Children's Center Benefit on March 10, 1990 at Henry Winkler's home in Toluca Lake, California. Actor Alan Thicke attending 'Hollywood Stars Night Baseball Game' on August 22, 1992 at Dodger Stadium in Los Angeles, California. Actor Alan Thicke and date Julie Tovilar attending the world premiere of 'The Bodyguard' on November 23, 1992 at Mann Chinese Theater in Hollywood, California. Pictured: Actor Alan Thicke, host Jay Leno during an interview on March 6, 1995. Actor Alan Thicke attending the premiere of 'G.I. Jane' on August 6, 1997 at Mann Village Theater in Westwood, California. Alan Thicke and Jason Alexander in dress rehearsal of 'Promises, Promises,' a musical at the Freud Playhouse at UCLA. Photo Iris Schneider. Actor Alan Thicke and son Carter Thicke attending the premiere of 'Adventures of Rocky and Bullwinkle' on June 24, 2000 at Loew's Universal Cinema in Universal City, California. Alan Thicke during 'Me, Myself & Irene' Los Angeles Premiere at Mann Village Theatre in Westwood, California, United States. Actor Alan Thicke skates at the opening of the Universal CityWalk Ice Rink on November 29, 2002 in Universal City , California. The rink will be open to the public through January 5, 2003. Actor Alan Thicke attends the Los Angeles premiere of 'Pinocchio' on December 22, 2002 in Los Angeles, California. The film opens in theaters nationwide on Wednesday December 25, 2002. Actor/producer Alan Thicke and model Tanya Callau pose after being married on May 7, 2005 at The One&Only Pamilla Resort in Cabo San Lucas, Mexico. Alan Thicke, Tanya Callou, Paula Patton and Robin Thicke attends the Opening Night at the 40/40 Club in Las Vegas, NV December 30, 2007. Actor Alan Thicke poses for photographs with his 2008 Jaguar XJ outside his home in Carpinteria, December 1, 2011. 'I'm In The Band' on Disney XD. Actor Alan Thicke and Pharrell Williams attend the Qream Launch Party on July 14, 2011 in Hollywood, California. Alan Thicke attends the 10th Annual Michael Jordan Celebrity Invitational Celebrity Dinner in BESO At Crystals at CityCenter on March 31, 2011 in Las Vegas, Nevada. Actor Alan Thicke and recording artist Robin Thicke attend The GRAMMY Nominations Concert Live!! Countdown to Music's Biggest Night at Nokia Theatre L.A. Live on December 6, 2013 in Los Angeles, California. Actors Charlie Sheen and Alan Thicke attend the Joe Carter Classic Charity Golf Tournament after-party at Shangri-La Hotel on June 26, 2014 in Toronto, Canada. Actor Alan Thicke attends the 2013 Summer TCA Party for the Hallmark Channel's on July 8, 2014 in Beverly Hills, California. Alan Thicke attends the Dodgers' Hollywood Stars Night Game at Dodger Stadium on June 6, 2015 in Los Angeles, California. Actor Flex Alexander, producer Tony Cornelius, actor Alan Thicke and actor/comedian Cedric the Entertainer attend the second annual Coach Woodson Las Vegas Invitational pairings party at the Lavo Restaurant & Nightclub at The Palazzo Las Vegas on July 12, 2015 in Las Vegas, Nevada. Alan Thicke arrives for the 'Cool Comedy - Hot Cuisine' benefit for the Scleroderma Research Foundation at Regent Beverly Wilshire Hotel on June 5, 2015 in Beverly Hills, California. Actor Alan Thicke and wife Tanya Callau arrive at the premiere of STX Entertainment's 'Bad Moms' at Mann Village Theatre on July 26, 2016 in Westwood, California. Actor Alan Thicke arrives for the Comedy Central Roast Of Rob Lowe at Sony Studios on August 27, 2016 in Los Angeles, California. The Canadian actor was most famous for his role as Jason Seaver, the dad on the '80s sitcom "Growing Pains." He was most recently in the Netflix reboot of "Fuller House. Thicke was tweeting about his time on the Netflix show hours before his death. In his early career, Thicke made a name for himself as a composer and a producer. He eventually got his own talk show "The Alan Thicke Show" from 1980 to 1983 before going on to star in many television series. Thicke received his first Emmy nomination for "The Barry Manilow Special" in 1977, went on to host popular shows in the 90s such as "Pictionary" and "Three's a Crowd." Thicke was also well known for his musical contributions and recorded TV theme songs for" Diff'rent Strokes," "The Facts of Life," "Wheel of Fortune" and "Growing Pains." At this time, his family has yet to make a public statement about his passing. Rest In Peace. To my friend #AlanThicke. This guy was the best. Always a gentleman, funny and talented. God Bless His wife Tanya and all of his Loved ones. You will be missed sir!!! #shocker #Damn! RIP, Alan Thicke. Had the chance to get to know him the last few years. Such a kind-hearted human being. Love to his wife and kids. RIP Alan Thicke. Can't believe it. Honor to have known you and to been able to work with you.